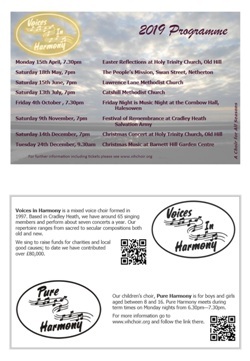 Voices In Harmony is a mixed voice choir, of mixed ability, based in Cradley Heath in the West Midlands, having around 70 singing members. Our aim is to introduce all people to the joys of singing as a Choir both sacred and secular compositions. Our members, male and female of all ages, meet to develop their knowledge, skills and techniques and sing for their own pleasure. In 2007 we formed a young people's Choir, Pure Harmony, for ages 8 to 16 with the aim of introducing youngsters to music and singing and hopefully eventually become members of Voices In Harmony! We are affiliated to the National Association of Choirs and are registered as a charity (number 1092116) with the Charity Commission. We hold about 6 Concerts a year, the majority of which we do to raise funds for Charities and local good causes. Since 2007, the Choir has raised approximately £27,000.